Eureka, this is by far the most insane batch I have ever made and probably the last post for this year. Plus a recipe brewed not so long ago like the ones I posted recently… Anyway, I am a big fan of Imperial Stouts and I am still working on some recipes to get myself a really great example of the Imperial Stout style. Sure I have made some really tasty examples in the past such as two versions of the legendary Rusalka Imperial Stout. 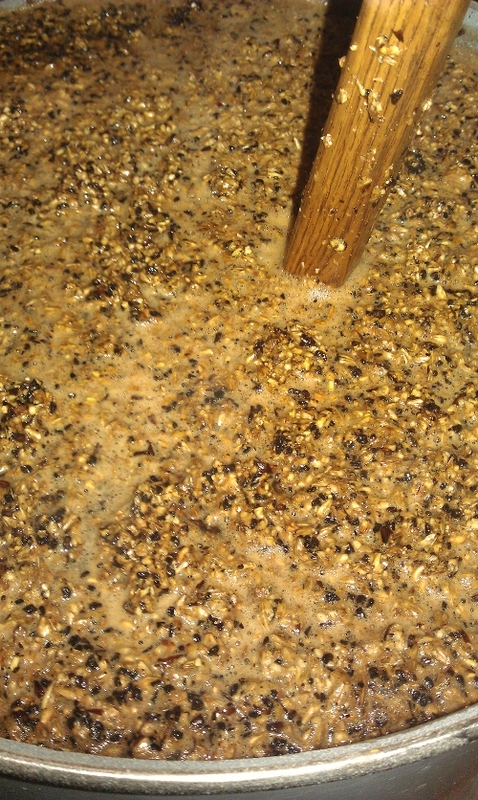 I even did a re-brew of the Rusalka Imperial Stout and let a part of if mature on Islay Whisky soaked wood chips. I added the Whisky to get yet another flavor compound. Islay Whiskys are well-known for their peaty character. The distillers on Islay (a small Scottish island) use peat to dry the green malt. This gives the Whisky a very peaty, smokey and phenolic taste. You either love or hate it. And I really, really like this character in the Islay Whiskys. Luckily for me, I can get my hands on some Islay malt. The smokiness you get from this particular smoked malt is very distinct to the one you get from the normal Bamberg smoked malt (Weyermann Rauchmalz). The smoked malt from Bamberg has huge smoked ham character. The Whiskymalt adds a very subtle smokiness to your beer. And not the overpowering smoked ham character. I will certainly post the tasting notes of the Whisky soaked Imperial Stout in the future. 10/14/12: An insane brew day begins with milling roughly 30 kg of malts (66 lbs). I had to mash-in in three different kettles! I filled my 50 L kettle (13 gal) and two other kettles with a volume of approximately 20 L of mash (5.3 gal) each. This made my wonder how I sparge such a huge amount of mash later on. Anyway, I left the mash rest at 65°C (149°F) for 90 min. I chose a lower temperature range for the rest to decrease the body of the beer later on. After the 90 min rest, 10 min rest at 78°C. I then transferred the whole mashes from the two smaller kettles in my lauter kettle (50 L, 13 gal) and sparged the first part of the mash and collected the runnings in a kettle. I stopped sparging as the kettle (25 L, 6.6 gal) was full (Fig 2). 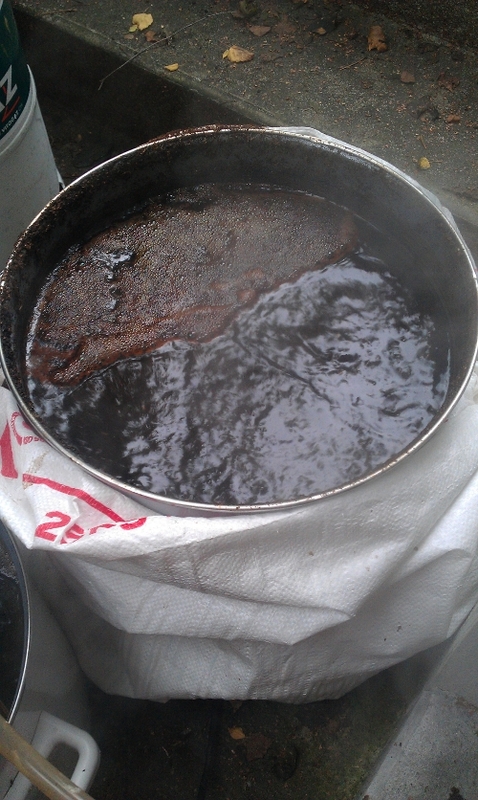 The color of the wort was already very, very black. I then emptied the lauter kettle and filled it up with the second part of the mash and collected the runnings until the 50 L kettle was full. I then went on collecting the runnings until half of another 25 L (6.6 gal) kettle was filled. Once all the three parts of the worts were boiling, I added the hops according to the recipe above. I split the hops between the kettles based on the volumes. Because I am very inquisitive, I could not stop to collect further runnings from the lautering kettle and measured the gravity. I was surprised, the original gravity was still at around 12°P (1.048). I therefore filled another kettle with the third runnings. I used these runnings for batch #68. Will post about this experiment in the future. After the boiling time of 90 min was over, I cooled the wort down to approximately 22°C and pitched a huge yeast cake of Wyeast’s #1084 Irish Ale I had from a previous batch of Imperial Stout. The fermentation started after several hours already. 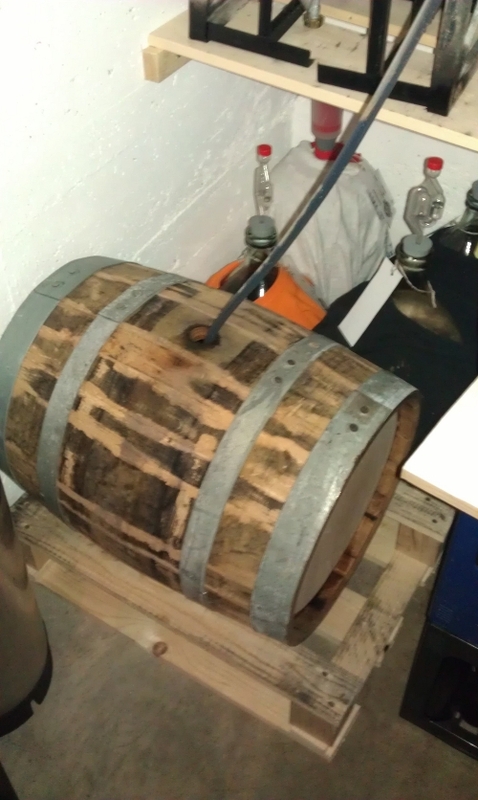 25/10/12: Racked the beer off the huge yeast cake directly into a small Whisky barrel (Fig 3). I recently bought a small barrel (50 L, 13.2 gal) which was custom-made for me. The wood for the barrel is from a real full size Whisky barrel. The wood is therefore not fresh anymore and soaked in Whisky. I had a huge smile on my face when I got the barrel and unwrapped it: The Whisky smell was insane. Unfortunately, the barrel was not filled with an Islay Whisky. So no peatiness… Anyway, I got the barrel just a day before and rinsed it with some water first and added a shot of Bunnahabhain’s Darach Ur Whisky (Bunnahabhain is an Islay distillery with the characteristic peatiness) to kill any kind of bad microorganisms in there. Next step, I flushed the barrel with carbon dioxide to displace any oxygen in the barrel. Then added the fresh Koschei Imperial Stout. I even had to add another 10 L (2.6 gal) of a maturing Imperial Stout from another fermenter to fill the barrel. However, the barrel wasn’t filled up to the top after that as well. Adding water or anything else was no option since I do not want to dilute my Koschei Imperial Stout any further anyway. 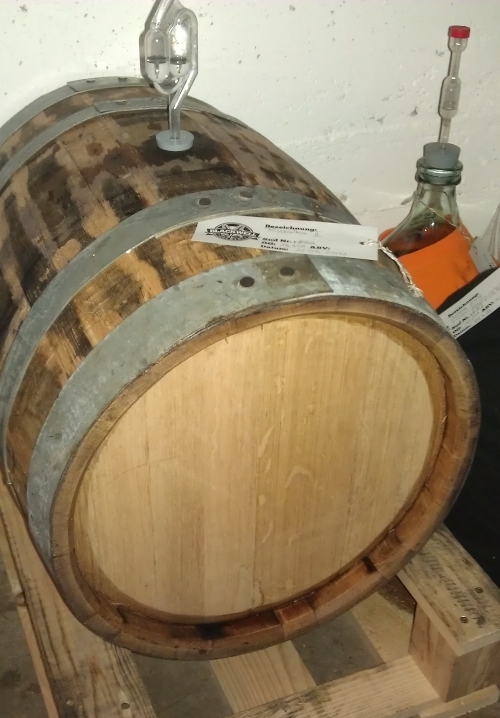 I keep my fingers crossed and hope no complications occur because of the small headspace in the barrel… Depending on how fast the wood and Whisky character are detectable in the beer, I might have to fill the barrel to the very top and leave the beer in there for several months. 22/12/12: The beer is now roughly two months in the barrel. Seriously I had to taste the beer from time to time and it is quite interesting to taste the changing character of the beer over time. The appearance is really dark and very oily. There is already a lot going on in the nose. I can detect lots of chocolate, coconut, vanilla and some alcohol as well. All in all a really nice nose already. What about the taste? Chocolate again, a hint of smoke, pepper, a decent bitterness and it finishes with a chocolate, coffee, bitter, roasted character. Maybe some cardboard in there as well… Warming sensation of the alcohol. The only thing that I am not really sure about is if the beer is oxidized. I am not sure if the cardboard taste originates from oxidation or from a different source. In addition, the beer is flat and it is hard to foresee how the carbonated version might taste like. The beer is on the right track in my opinion. It seems that it the beer can handle some further maturation in the barrel. I am really looking forward to taste this beer in a couples of years in the bottle already… Stay tuned for further updates concerning this batch. 03/29/13: Bottled part of the batch to a carbonation level of 1.5 vol of carbon dioxide. Beer spent roughly 5 months in the Whisky barrel. Remaining shares of the beer mature in kegs for further uses. 05/13/11: Brew day number 31. All went according to the protocol above. Crush all the grains as mentioned in the recipe but crush the acidified malt separately. Then mash in at 45°C (113°F) but not the acidified malt. 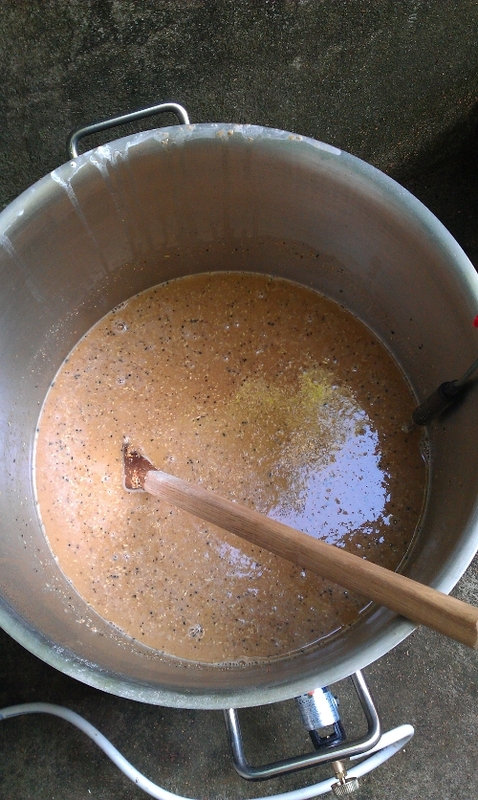 This malt is added after the 20 min rest at 45°C (113°F). The reason for this is to prevent a lower mash pH during the ferulic acid rest at 45°C. For further information have a look at a previous post of mine #48 Dunkler Nachthimmel. Then do the next rests at the mentioned temperatures, then sparge and boil the wort for 90 min with the hop addition. This beer is not about hops and therefore only a small amount of hops is added. After the boil fill 10% of the wort’s volume into clean, disinfected glass bottles. In my case 2 L (0.53 gal). 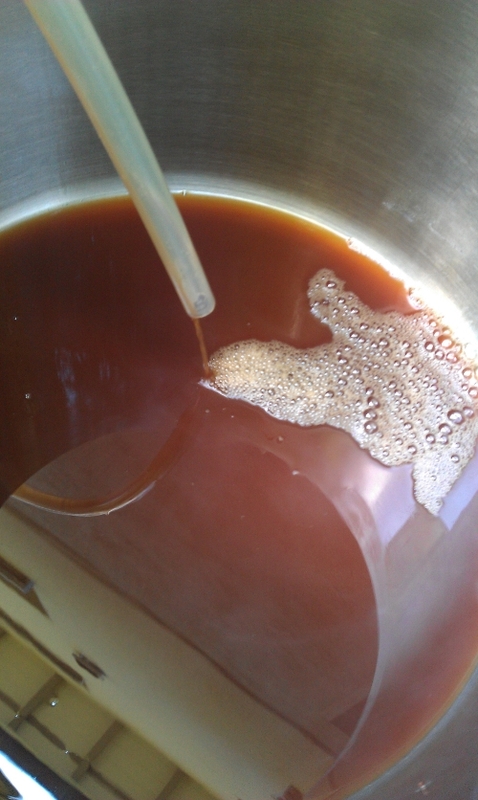 This fresh wort is needed at bottling to get the right amount of carbonation. Store the fresh wort in a refrigerator. Cool down the rest of the wort to pitching temperature of about 20°C (68°F) and pitch healthy Wyeast’s #3068 Weihenstephan yeast or any other wheat yeast you want. I then leave the bottles at fermentation temperature for another week or two and then store the bottles in a refrigerator. The beer is ready to drink within three weeks after bottling. Aroma: Lots of banana, some caramel notes and the typical wheat beer character. No sulphur. Very nice aroma. Makes you thirsty! Appearance: Brown color, the yeast in suspension makes it cloudy. Three finger tan, frothy head with a lot of bubble rising to the top. Flavor: Pretty much the same notes I could detect in the aroma. Banana in the front, some caramel character, hints of spicy, phenolic notes. Mouthfeel: Light-medium body, lively carbonation. Finishes with a malty and fruity aftertaste. The light-medium body makes it a bit heavier than a normal, pale wheat beer. However, the higher body does not make it less enjoyable. It is still a very easy to drink beer. Overall Impression: I really like this beer. It has all the characteristic aroma, flavor profile you would expect from a wheat beer. Plus some additional character from the darker malts such as caramel. I am pretty satisfied with this recipe and would not change anything. 02/26/2011: Brew day. I chose to do a small SWaSH batch with 1 kg of wheat malt and some Tettnanger hops. I then preheated the mash water up to 47°C and inserted the malt bag into the kettle and added the crushed wheat malt. I then did the rests as mentioned in the recipe and pulled the bag out after resting at 78°C for 10 min and washed the grains with the sparing water. By the way, the iodine test was negative. Boiled the wort for 60 min with the small hop additions and cooled the wort down to 20°C (68°F) and added 25 billion (2.5E10) yeast cells for 5 L of wort. 03/05/2011: Its bottling time. Five days after brew day I bottled the beer with some sugar to get a carbonation level of approximately 4.0 vol of carbon dioxide. I then left the bottles carbonate and mature for nearly 14 days at room temperature and then put the bottles in a refrigerator. Aroma: Lots of banana, no hop character and no malt character detectable. Smells like a traditional South German wheat beer. Appearance: Pale yellow color, lots of carbon dioxide bubbles rise to the top and form a very creamy, white head. Very good head resistance. I added some of the yeast sediment to get the real wheat character. Flavor: Not a lot is going on here. Banana again and some of the lightly sour, bread, grainy character of the wheat malt is detectable. And the yeast gives the beer the typical yeasty, doughy character. Mouthfeel: Light body, lively carbonation. Rather short and sweet, malty aftertaste. Very refreshing. It seems that a 100% wheat beer is possible to make and enough enzymes are present in the wheat malt for a complete mash conversion. What about the wheat malt? First of all, the beer tasted like expected. Rather one-dimensional and lots of the wheat malt comes through. Hops are in the background and some of the wheat yeast character comes through as well. That’s what I was going for in the first place with this experiment. At least I now know what the wheat malt can contribute to such a beer. Comparing the flavor profile of this beer with other homemade wheat beers from the past and some commercial examples, going the extra mile with a 100% wheat malt beer does not seem to have a big impact on the beer. I therefore can’t see any advantages brewing a 100% wheat malt based beer compared to a wheat beer made with 50% wheat malt and 50% barley malt. Thanks for reading and commenting if you like and stay tuned!